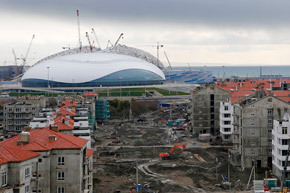 A general view shows the construction site of the Olympic athletes village in front of the Olympic Park with the Olympic stadium for the Sochi 2014 Winter Olympics in Adler, near Sochi. A general view shows the construction site of the Olympic athletes village in front of the Olympic Park with the Olympic stadium for the Sochi 2014 Winter Olympics in Adler, near Sochi. Source: Reuters.